Libyan investors due in Zimbabwe for talks on "acquisition of assets"
dollars, left banks without enough cash for regular withdrawals. The official exchange rate of 800 Zimbabwe dollars to the U.S. unit. The black market, or "parallel" exchange rate, is 1,400-1.
chief economist at the independent Zimbabwe National Chamber of Commerce. empty gas stations for up to three days. who can't get transportation to work. Industrial production is estimated to be more than 60% below capacity. factories have been without power for six hours a day. customer" and reserved the right to shut off power at short notice. elections last year that independent observers said were rigged. Foreign funding accounted for nearly half the hard currency inflows. ink and security seals, state radio reported Friday. banks without enough cash for regular withdrawals. economist at the independent Zimbabwe National Chamber of Commerce. owners in what drivers call "hope" lines. mind-boggling," said Farai Zizhou, acting head of the confederation. 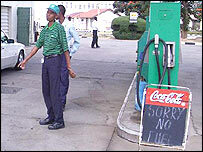 Zimbabwe faces its worst economic crisis since independence in 1980.
have been without power for six hours a day. the right to shut off power at short notice. Zimbabwe imports 35 percent of its power requirements. and froze computers at firms without back-up power. breakdowns and shortages of spare parts and equipment. confiscation of thousands of white-owned commercial farms since 2000. The state telephone company says it has begun ripping out its pay phones. Jowa, the chamber of commerce economist, said not much of that was in sight. last year that independent observers said were rigged. organisations urging them to intervene. journalists have been expelled from the country over the past two years. the Guardian for 22 years. election victory a year ago. legal challenge 90 days after the results were announced. refuses to provide ballot papers and boxes from the disputed election. says all of these breaches of procedure are illegal. between the ruling ZANU-PF and the opposition party. Mr. Mugabe said he would not talk to Mr. Tsvangirai unless he took the step. beneficiary of Zimbabwe's controversial land reform program. administration would be biased against him. Judge Paddington Garwe. He would normally hear a case of this importance. The Zimbabwe government can no longer afford to pay for the ink and special paper needed to print the local currency according to the state-controlled Herald Newspaper. It said the government had no foreign currency to pay for the materials, which have to be imported. Local money will now be added to the long list of shortages in the country. Long queues of people waiting outside banks to withdraw cash are already a familiar sight in the capital, Harare. The shortage of banknotes will add to the frustrations for people who are already coping with shortages of fuel and basic commodities. 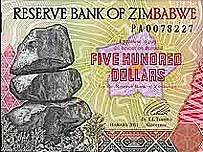 The newspaper report said banks had resorted to issuing the small 100 and 50 Zimbabwe dollar bills (worth 12 US cents and six US cents). But that is unlikely to help in a country where inflation stands at 228% and prices increase weekly. conduct bilateral talks and visit community development projects. Nick Sheppard said on Friday. country's political and economic crisis. two would meet again to continue discussions. country's former coloniser, must pay for. expression and the rights of media workers. that promote access to information. the consistency that has been shown by the Supreme Court so far. instability, President Thabo Mbeki said today. possibility to address anything else other than the issue of law and order. South Africa would never treat Zimbabwe as its tenth province. that the leadership of Zimbabwe itself holds the same view. political change, a top US diplomat said on Friday. for Africa, said in an interview on Friday. elections, as well as direct bilateral aid, Mr Kansteiner said. a credible and legitimate process unfolding, and a transition occurring." However, he added: "I don't see any red lines." help for Zimbabwe until Mr Mugabe resigns and new elections are held. involvement, and I'm quite hopeful," he said. Mr Tsvangirai if he drops a legal challenge to his re-election last year. change" in Zimbabwe. "The people of Zimbabwe must decide their own future,"
is worthless, that all the world knows that you are a tired old man with nothing to show for your almost 80 years but hatred, sycophancy, from the people you are supposed to be leading to whatever your twisted mind considers your treasured goal. or protected by a host of microphones on a rostrum, heavily guarded by a bunch of hoodlums in uniform. Barking, frenzied, spewing hatred like a terrified, sick minded dog barking at shadows, at everything that moves. Watching your hated rival walking fearless, made riotously welcome in the streets of the townships where you dare not go for fear they might tear you limb from limb (as possibly they well might. How are your stomach pains, your headaches? Worse, much worse? You might be an object of pity if there had been the slightest pity shown by you for those you and your henchmen tortured, raped, beat to a pulp. But no; only now an object of derision - and hatred. Keep on having your sleepless nights, old man, tortured by your fears, your insecurity. recall that the Beast is one with the mighty Beelzebub below, the Devil himself. are upon you, and there is no escape from the punishment those curses will bring you. allow him to travel to Malawi next week. the high court for the release of the passport. helping to organise a national strike in March last month. after the three African leaders' visit. widely disputed victory in presidential elections last year. Tsvangirai and Ncube to travel to Malawi. over a protracted period and many have lost their lives as a result. This is part of the advert "Don't subsidise their lawlessness and violence. by those who organized, encouraged or supported the illegal stayaway. Cabinet. Phone: 4-703891 or Fax: 4-790402". without fear of violence, eviction and persecution. dereliction to duty in upholding the rule of law. experience that you had in this time. were involved with such a situation. hand account of a situation where you were involved with such a situation. of a situation where you were involved with such a situation. you were involved with such a situation. · Have police refused to take reports and give out RRB and CRB numbers? court orders that might have brought farming operations back to normal? urgency. Two or three pages will be more than adequate. about, he will be held responsible"
under Section 5 notice in The Herald. and the first Sec. 8 under each new process has a 90-day maturity period. 8 order with a 7 day maturity. is available electronically or from our office in hard copy. to contact our offices on 04 799410. Independence Day interview when he hinted at his retirement. against any eventuality," a source said. Noczim failed to raise foreign currency. credit -and the pipeline is gone," an industry source said. only be used to transport Libyan fuel." era and try to assess the country's recovery prospects. how much is recoverable, and how long might a recovery process take? difficult and full recovery will be less likely. loss of skills, especially in the industrial sector and in the professions. accountants, lawyers and doctors - have left the country. Few will return. hard to persuade any of these enterprises to return. and could quickly be brought back to full production. revived in a relatively short time. and clung to their title deeds in the hope that things will change. financial resources, labour and government back-up. bean, sorghum and tobacco, now lie unploughed and overgrown with weeds. head of export quality cattle, and which is now deserted. farms. A substantial part of the agricultural economy could be revived. make productive use of it. available commercial farmers back on the abandoned farms by June or July. Mbeki, Obasanjo and Muluzi in their dealings with Mugabe. recovery until the 2005 season. credibility is vital to the recovery process. for Zimbabwe and the region. story, in which the dictator crowed about his people's "happy lot." But there are no protests on the streets of America. organizations, students, and the Zimbabwe Human Rights NGO Forum. is at present admitted in hospital. She shows signs of acute anxiety." the homes of the victims. Some perpetrators were in police uniforms. . . .
upgrading the human rights status of Sudan, the notorious land of genocide. structures of repression,' said Mr. Ndlovu." Zimbabweans get rid of the dictator who is their master now? because he poses no threat to their vital interests. regime." Any investigative reporters working on those business associates? chiefs to "unlock the mystery" surrounding the historic monument. underground in front of the chiefs and Government officials. under the monument you see today," said Sekuru Chinhope. caves underground especially during the rainy season." permission to prove his case. Government officials have decided to let him prove his story. The Great Zimbabwe is one of the country's star tourist attractions. was shrouded in mystery for generations. century, its origins were bitterly fought over by rival antiquarians. positively identified the architects as African. fact, the work of Shona-Karanga civilisation. crime under the Public Order and Security Act. stories lie the daily hardships felt by the capital's 1,7-million people. supermarkets, petrol queues and blackouts. Harare. "We used to laugh at Zambians because of all the shortages they had. Now they are laughing at us because it is much worse here," said a salesman. "We never thought it would get this bad." in downtown Harare. The president was met by jeers and hoots of derision. make derogatory comments or gestures to the presidential motorcade. barred from his office and has gone into hiding after receiving threats. busy. But on closer inspection, rows and rows of toilet paper are displayed. thought it would come to this." and everyone in Zimbabwe grapple with daily. rent for a small two-roomed house, more than half of her salary is gone. brothers in the rural areas. There is just not enough money," she said. areas. Now I see it in city children." Africa for all the surplus food it exported. and grabbing, the bread is gone. One woman was knocked down in the scuffle. supporters, according to local newspaper reports. deliveries are made. People queue there for hours. people get, the sooner they will press Mugabe to go."